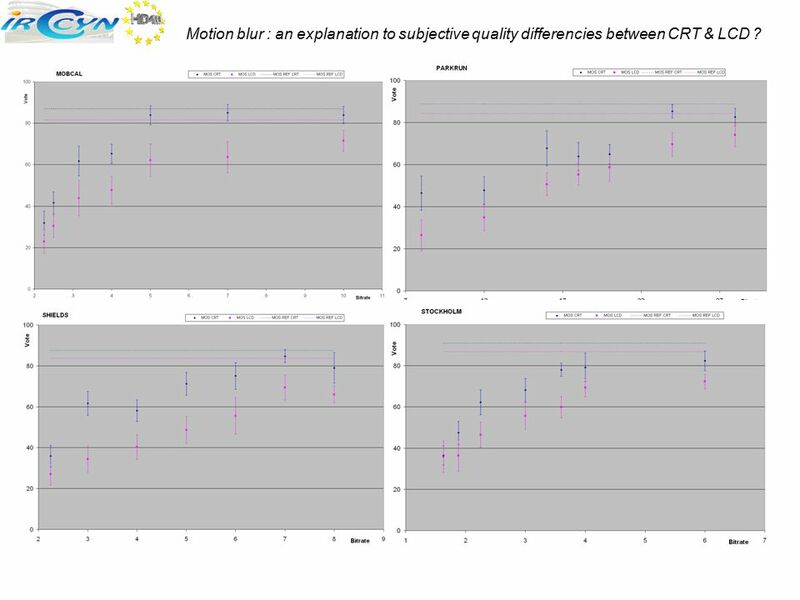 5 Motion blur : an explanation to subjective quality differencies between CRT & LCD ? 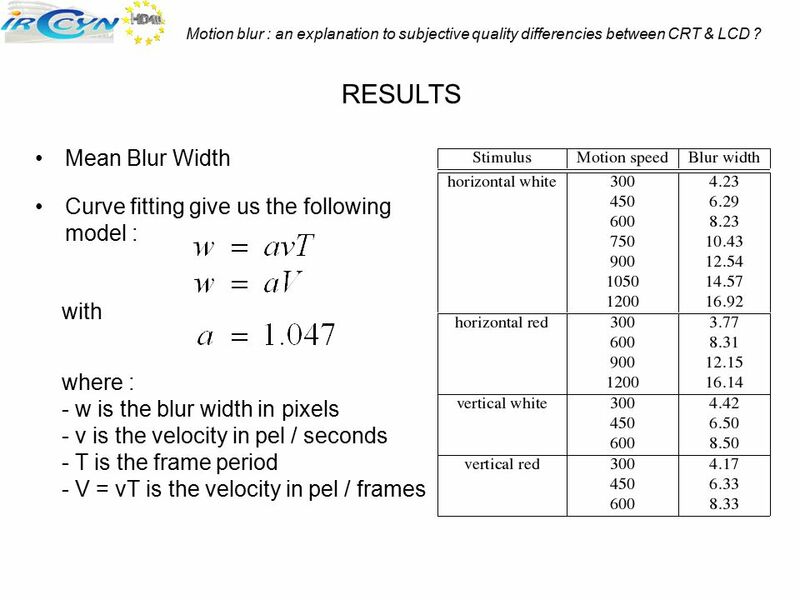 7 Motion blur : an explanation to subjective quality differencies between CRT & LCD ? 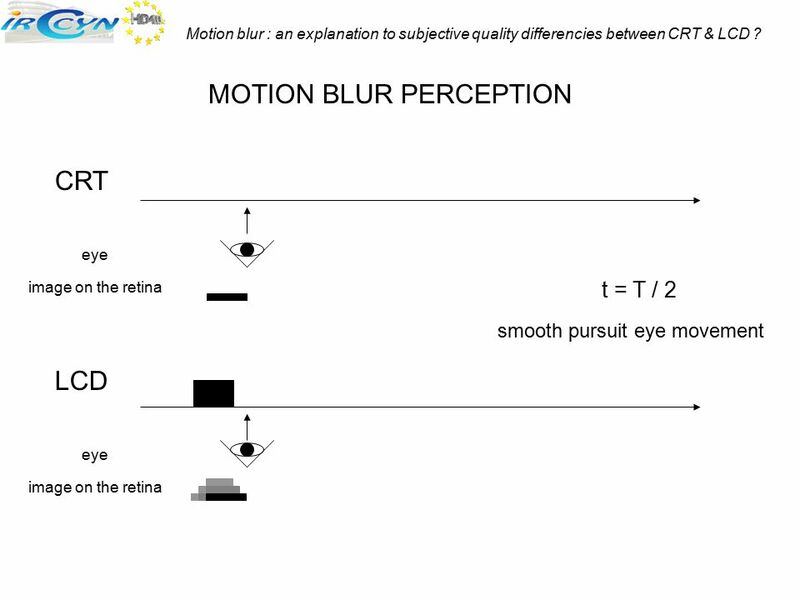 8 Motion blur : an explanation to subjective quality differencies between CRT & LCD ? 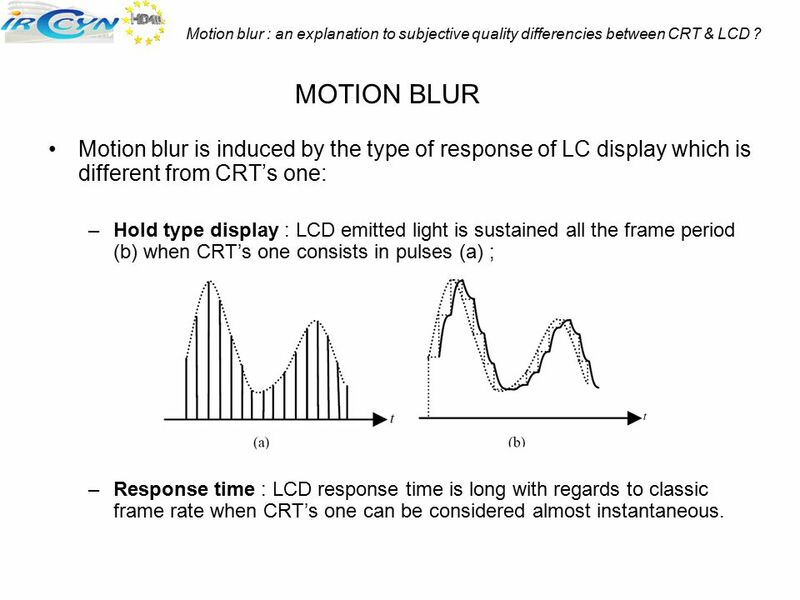 Motion blur is induced by the type of response of LC display which is different from CRT’s one: Hold type display : LCD emitted light is sustained all the frame period (b) when CRT’s one consists in pulses (a) ; Response time : LCD response time is long with regards to classic frame rate when CRT’s one can be considered almost instantaneous. 9 Motion blur : an explanation to subjective quality differencies between CRT & LCD ? 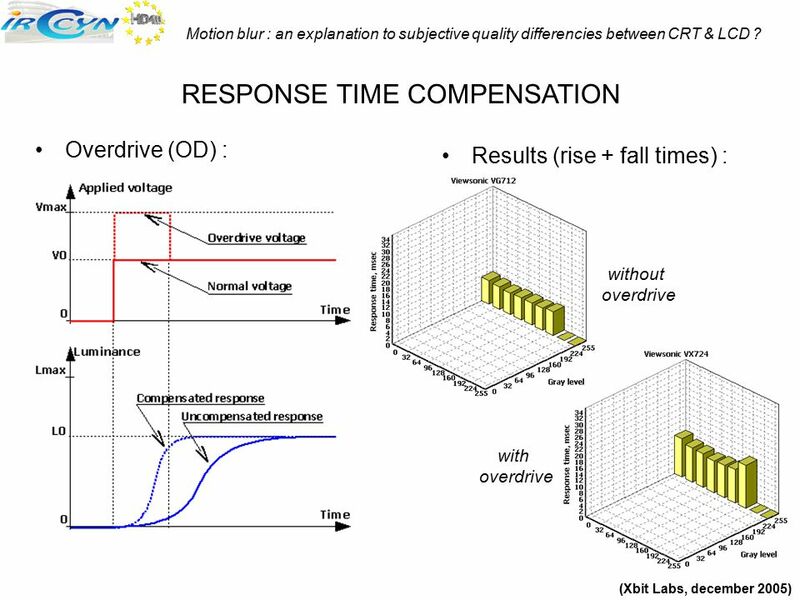 LCD RESPONSE TIME ISO : response time is the sum of rise time (from black to white) and fall time (from white to black). 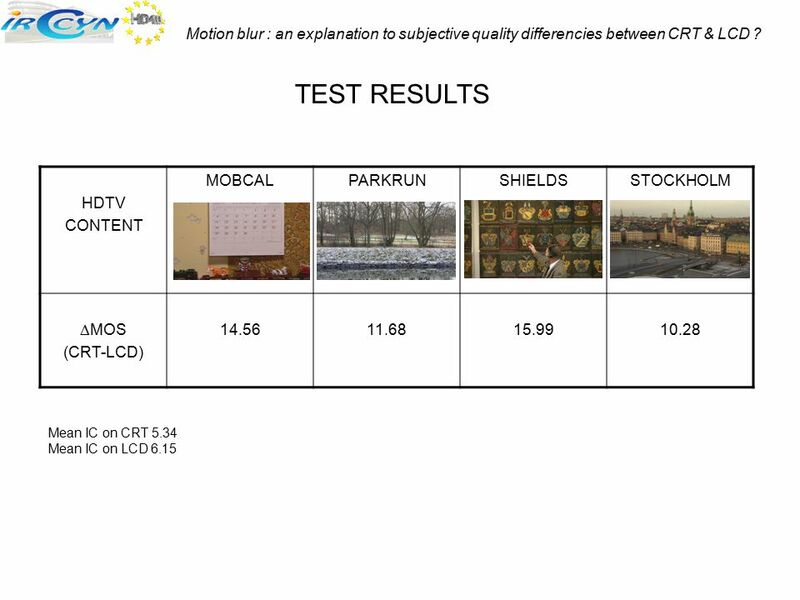 Manufacturers specify this response time or even only the rise time from black to white. 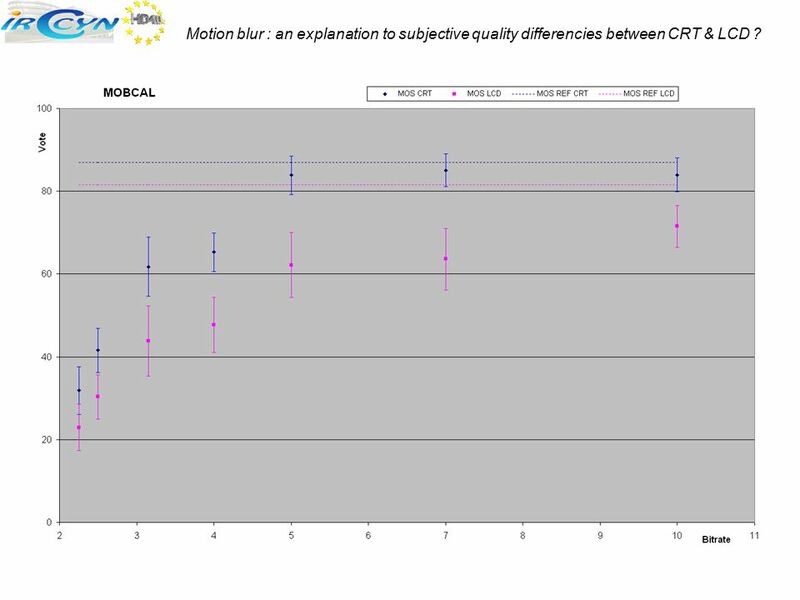 But gray-to-gray transitions are very slowest. 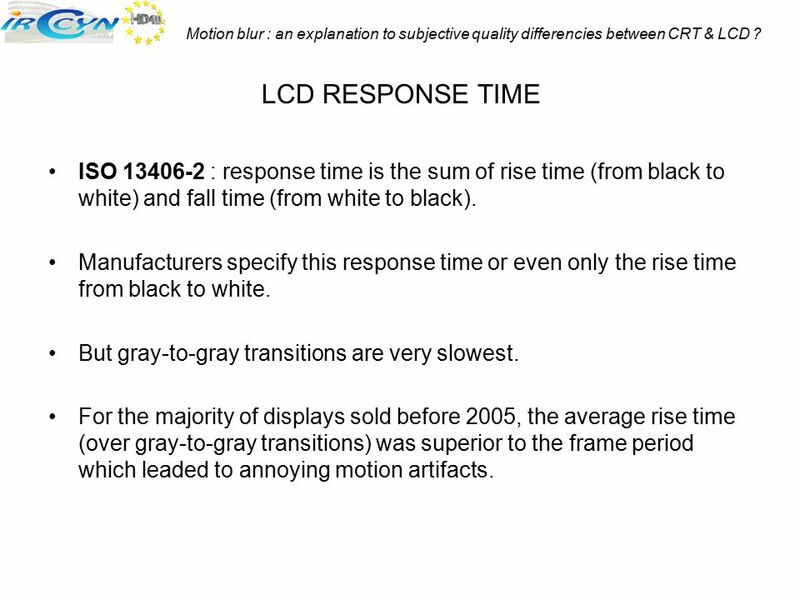 For the majority of displays sold before 2005, the average rise time (over gray-to-gray transitions) was superior to the frame period which leaded to annoying motion artifacts. 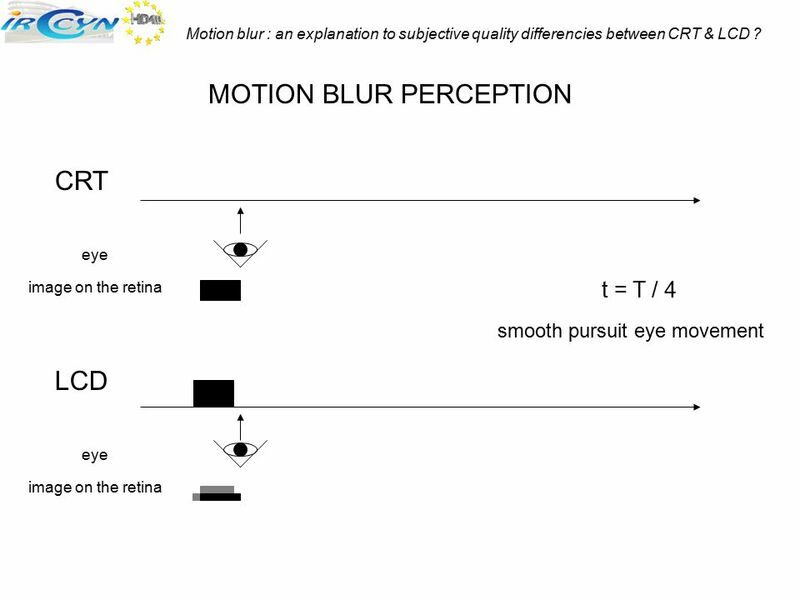 11 Motion blur : an explanation to subjective quality differencies between CRT & LCD ? 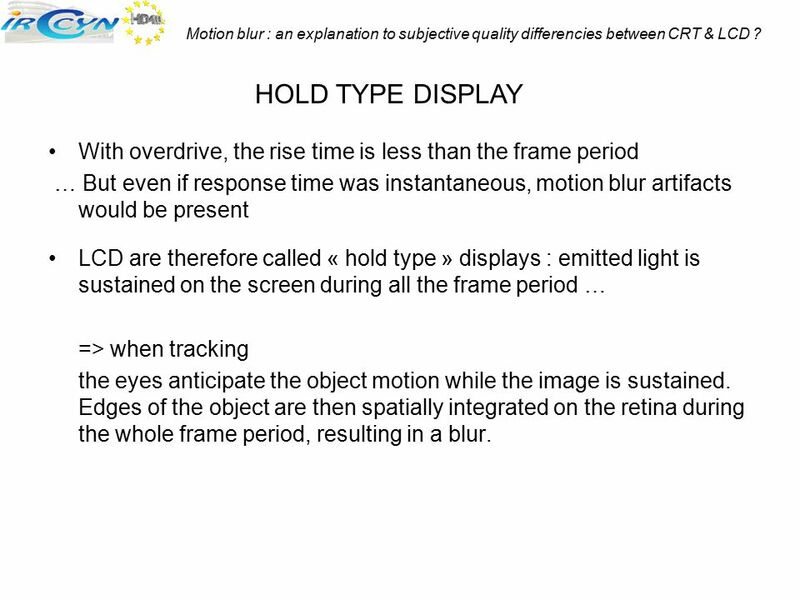 HOLD TYPE DISPLAY With overdrive, the rise time is less than the frame period … But even if response time was instantaneous, motion blur artifacts would be present LCD are therefore called « hold type » displays : emitted light is sustained on the screen during all the frame period … => when tracking the eyes anticipate the object motion while the image is sustained. 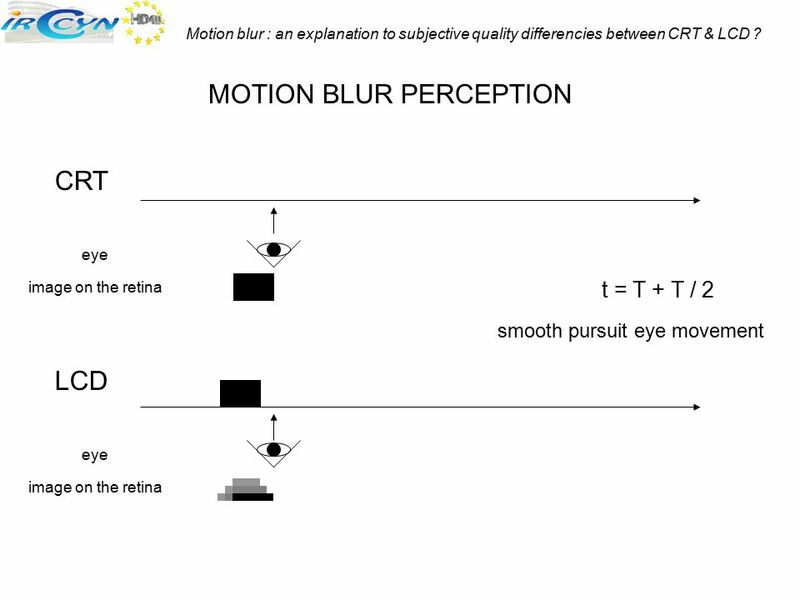 Edges of the object are then spatially integrated on the retina during the whole frame period, resulting in a blur. 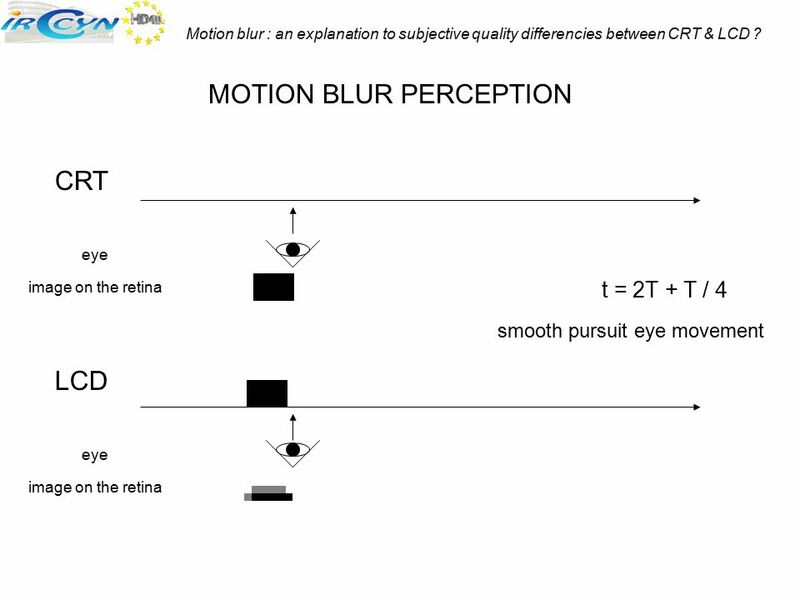 24 Motion blur : an explanation to subjective quality differencies between CRT & LCD ? 25 EXPERIMENT : TASK The scrolling of the bars was continuous. 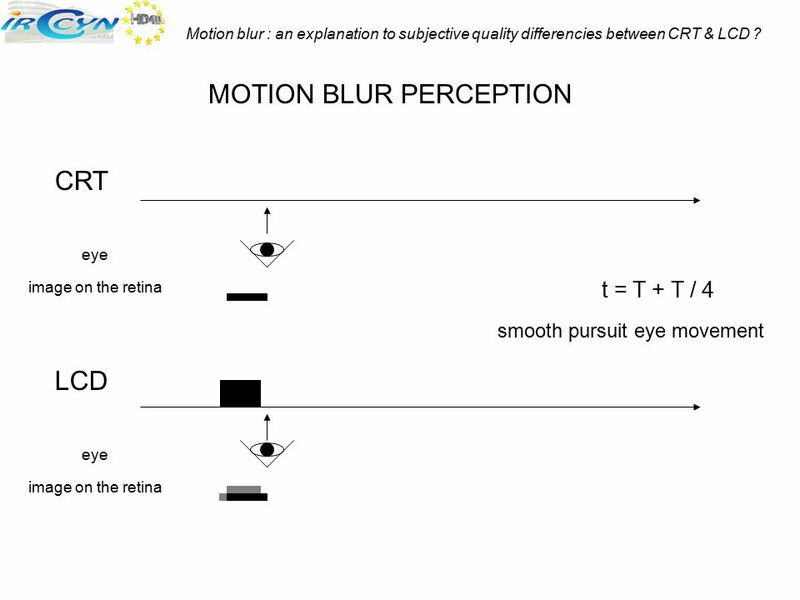 Motion blur : an explanation to subjective quality differencies between CRT & LCD ? 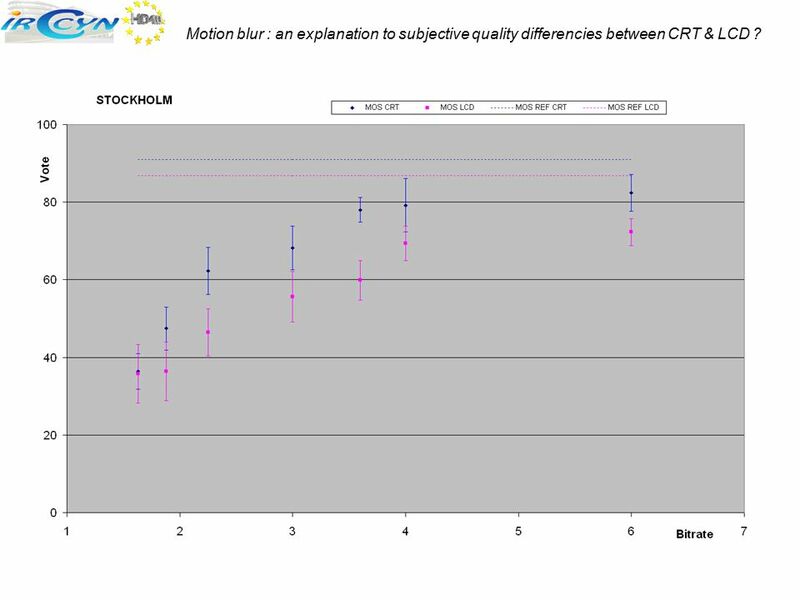 EXPERIMENT : TASK The scrolling of the bars was continuous. 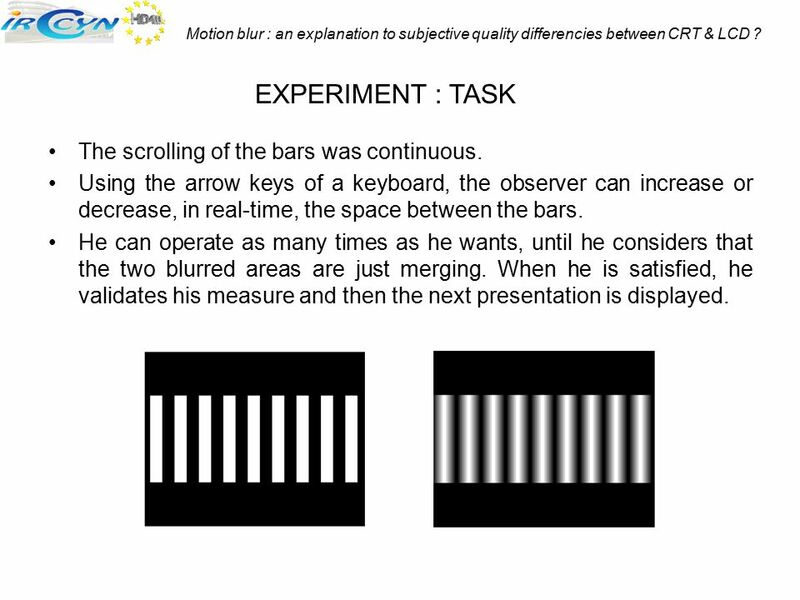 Using the arrow keys of a keyboard, the observer can increase or decrease, in real-time, the space between the bars. 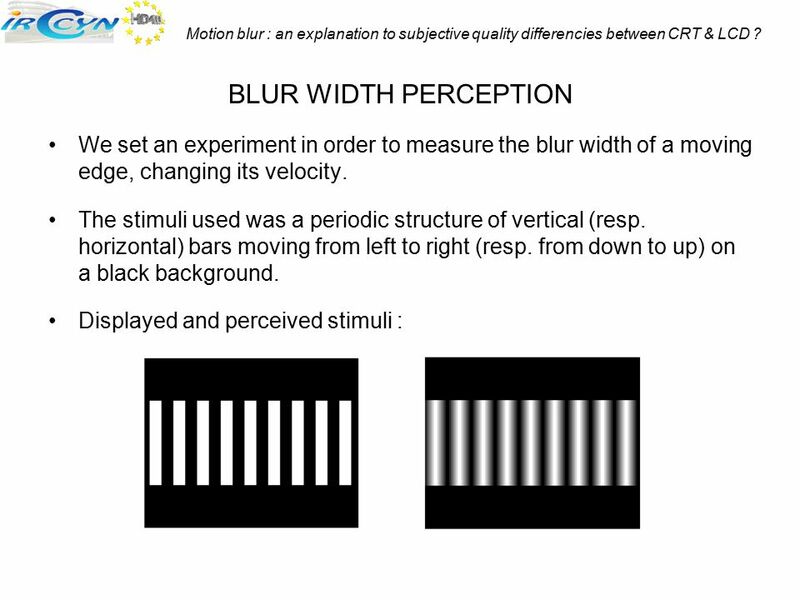 He can operate as many times as he wants, until he considers that the two blurred areas are just merging. When he is satisfied, he validates his measure and then the next presentation is displayed. 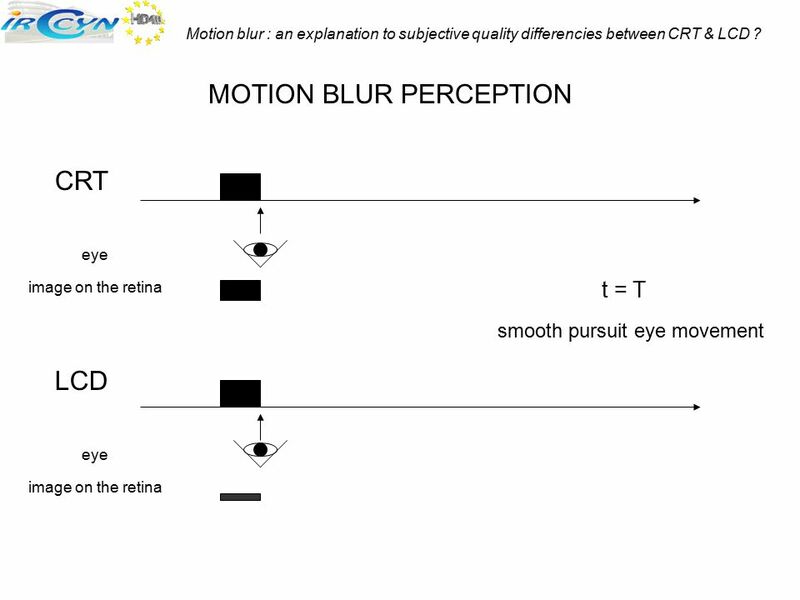 Motion blur : an explanation to subjective quality differencies between CRT & LCD ? 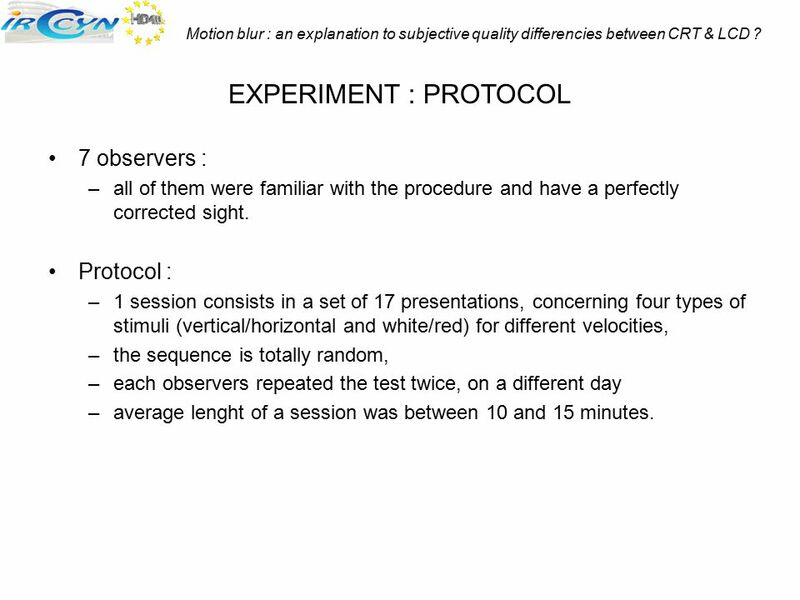 EXPERIMENT : PROTOCOL 7 observers : all of them were familiar with the procedure and have a perfectly corrected sight. 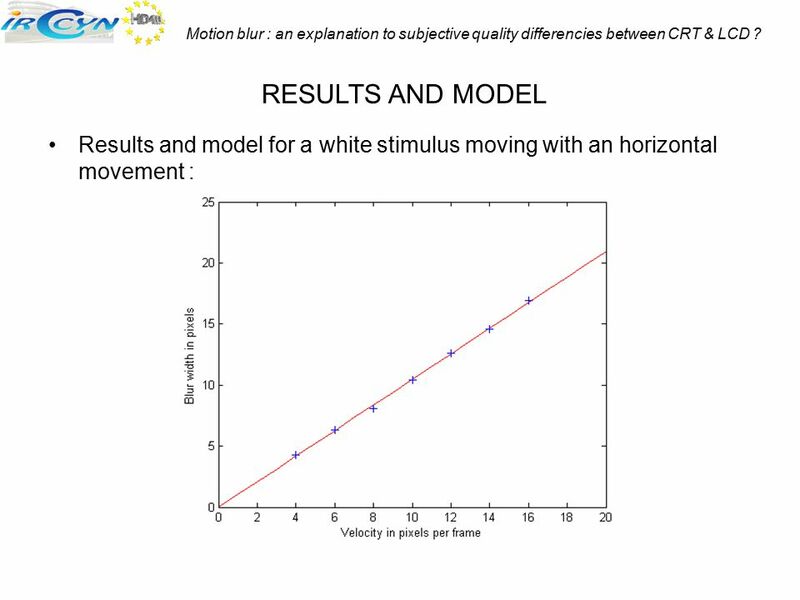 Protocol : 1 session consists in a set of 17 presentations, concerning four types of stimuli (vertical/horizontal and white/red) for different velocities, the sequence is totally random, each observers repeated the test twice, on a different day average lenght of a session was between 10 and 15 minutes. 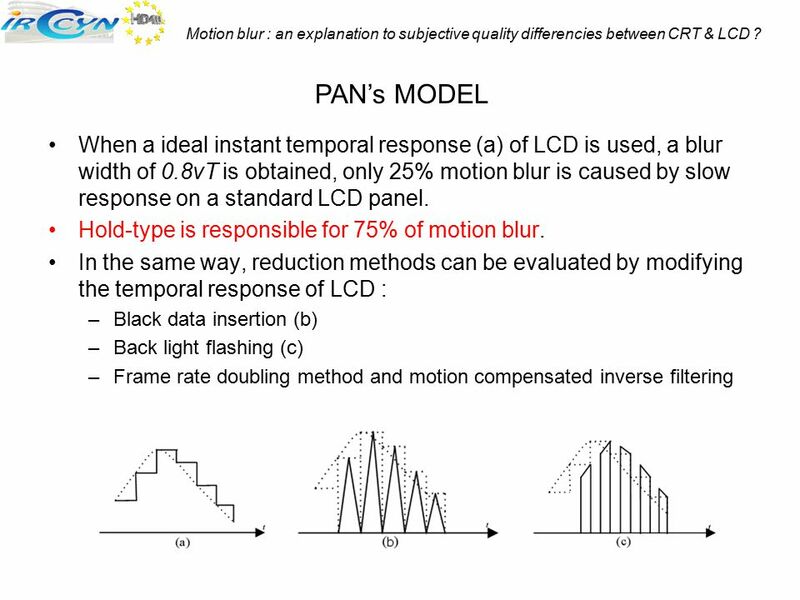 28 Motion blur : an explanation to subjective quality differencies between CRT & LCD ? 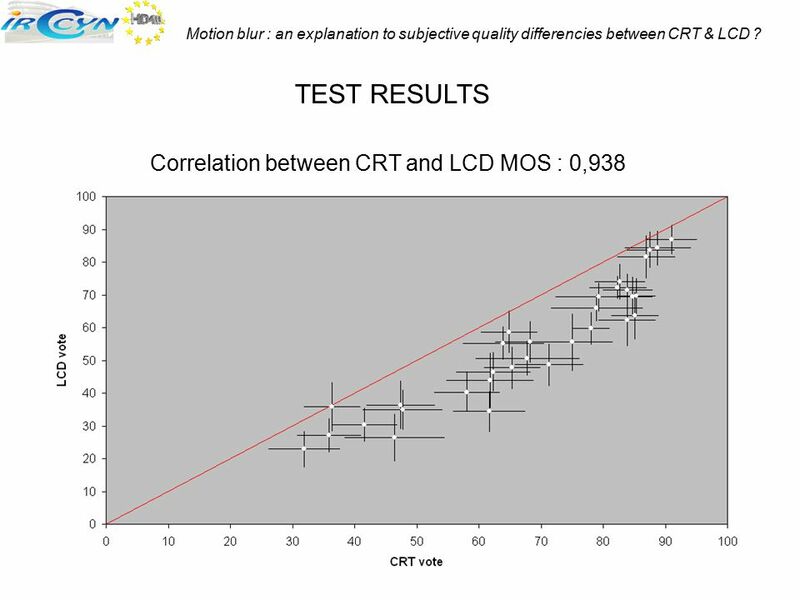 29 Motion blur : an explanation to subjective quality differencies between CRT & LCD ? 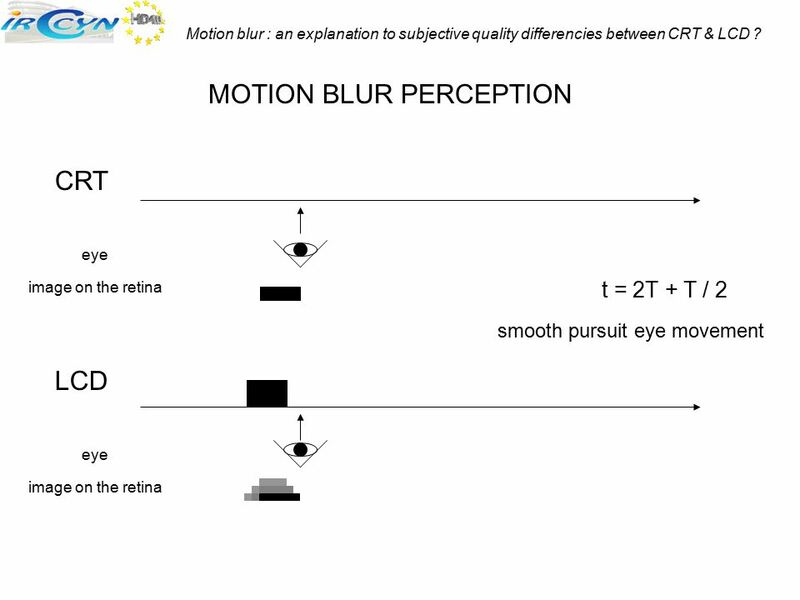 30 Motion blur : an explanation to subjective quality differencies between CRT & LCD ? 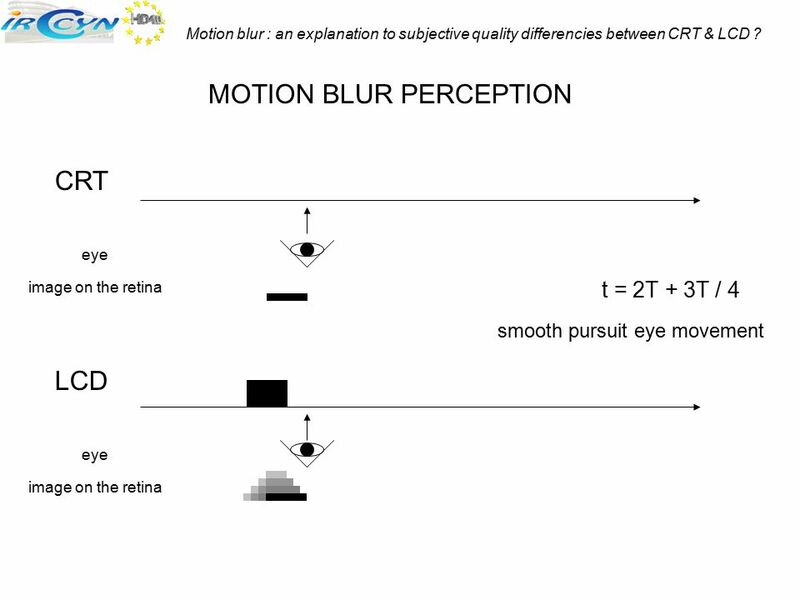 31 Motion blur : an explanation to subjective quality differencies between CRT & LCD ? 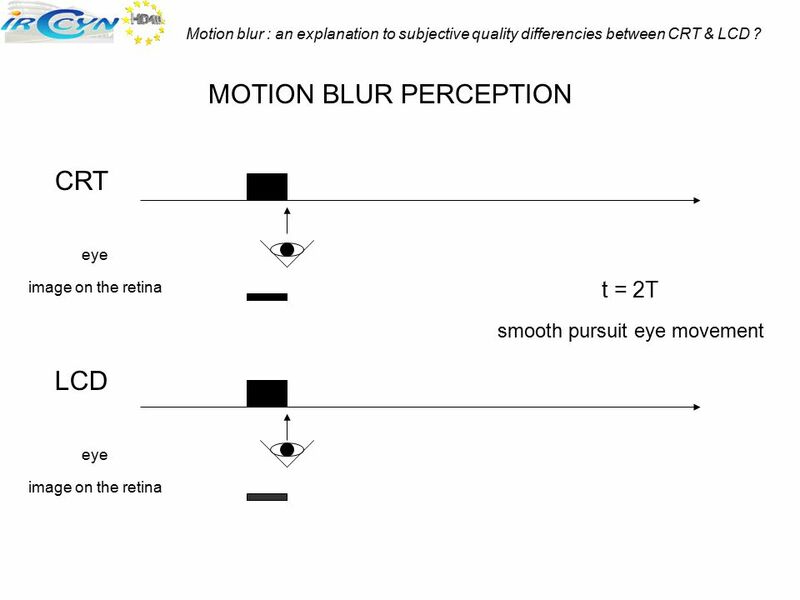 32 Motion blur : an explanation to subjective quality differencies between CRT & LCD ? 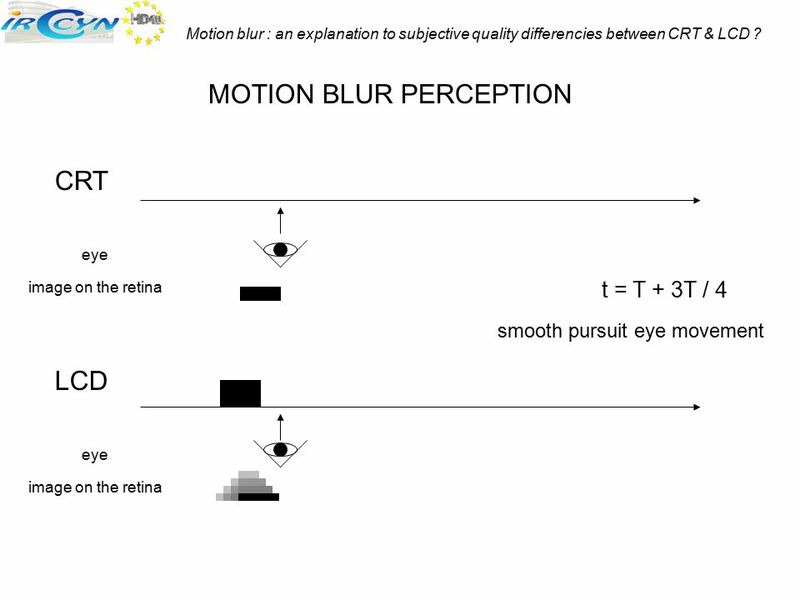 33 Motion blur : an explanation to subjective quality differencies between CRT & LCD ? 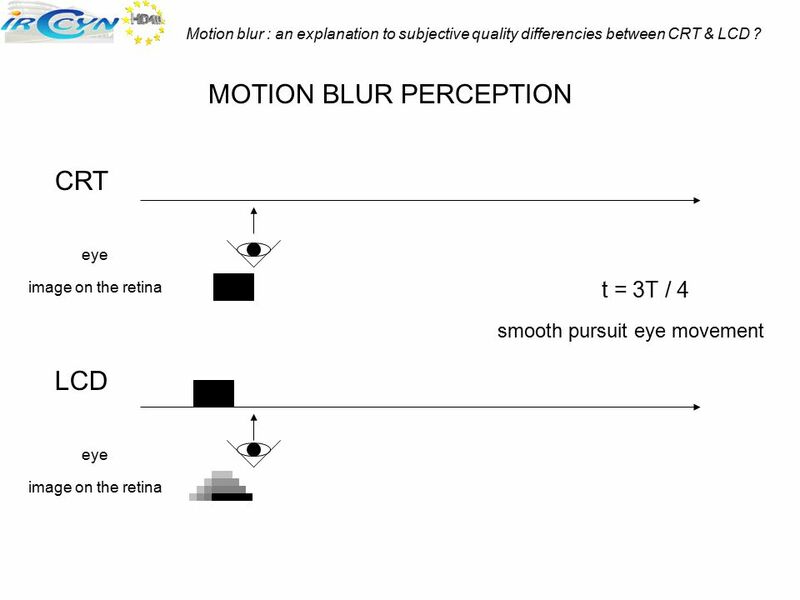 34 Motion blur : an explanation to subjective quality differencies between CRT & LCD ? 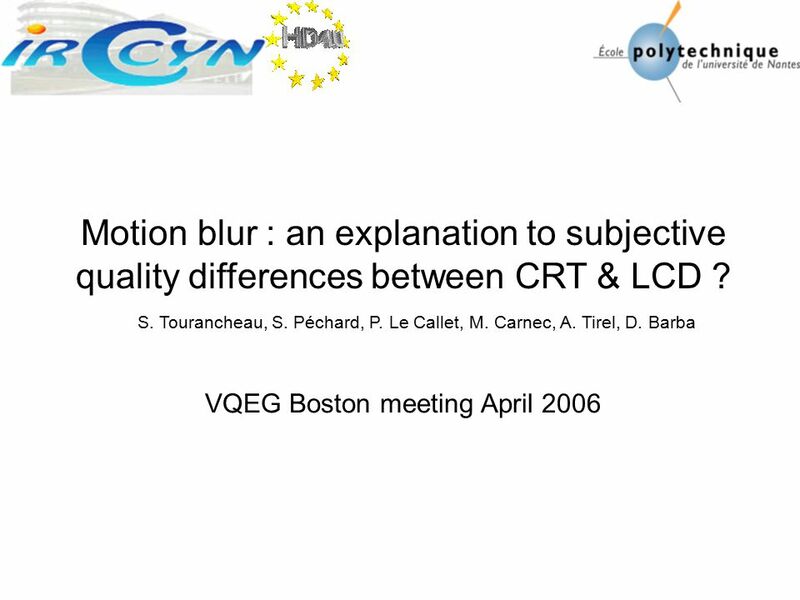 Download ppt "VQEG Boston meeting April 2006"
Television. Question: A television image is created by beams of moving electrons that collide with the inside front surface of the television picture. Eric Moore Computer Users Group of Greeley. Plasma Each pixel consists of three gas-filled cells Electric current ionizes the gas, emitting UV that stimulates. 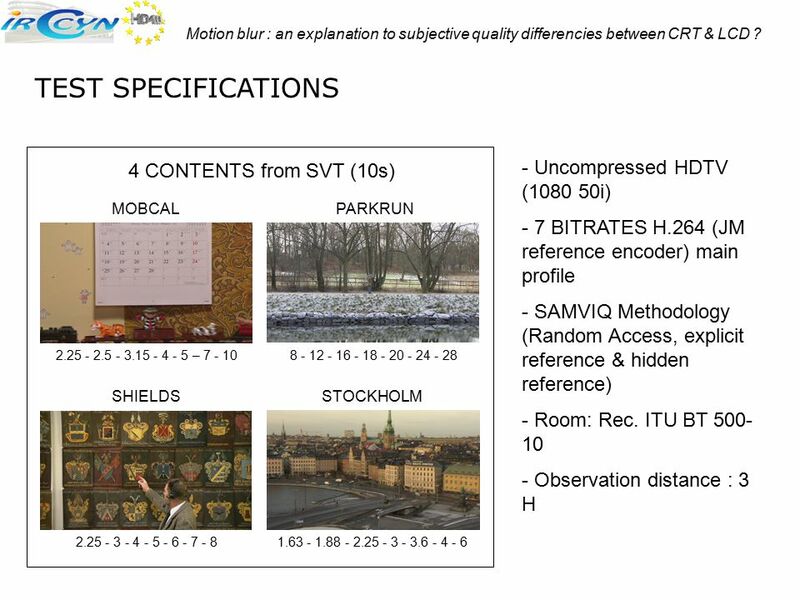 Basics of MPEG Picture sizes: up to 4095 x 4095 Most algorithms are for the CCIR 601 format for video frames Y-Cb-Cr color space NTSC: 525 lines per frame. 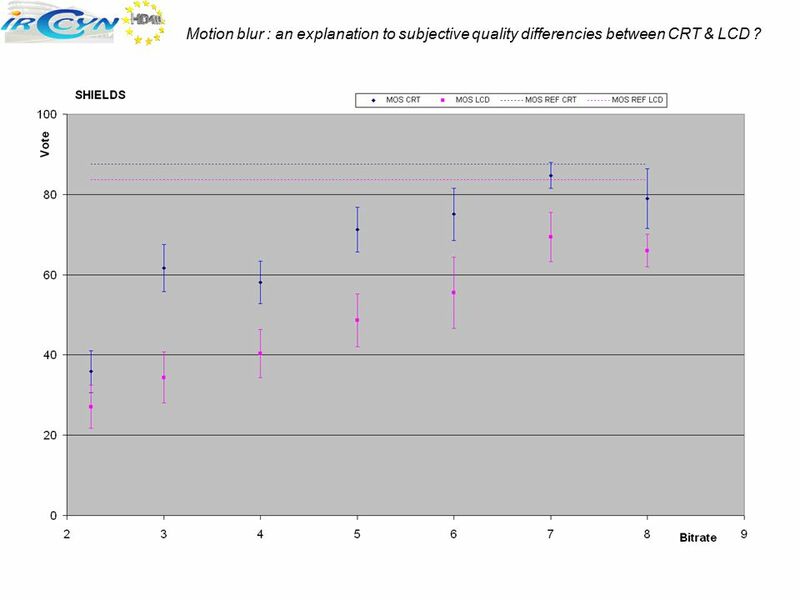 Comparison of subjective test methodologies VQEG Berlin meeting June 2009 P. Le Callet, R. Pépion. 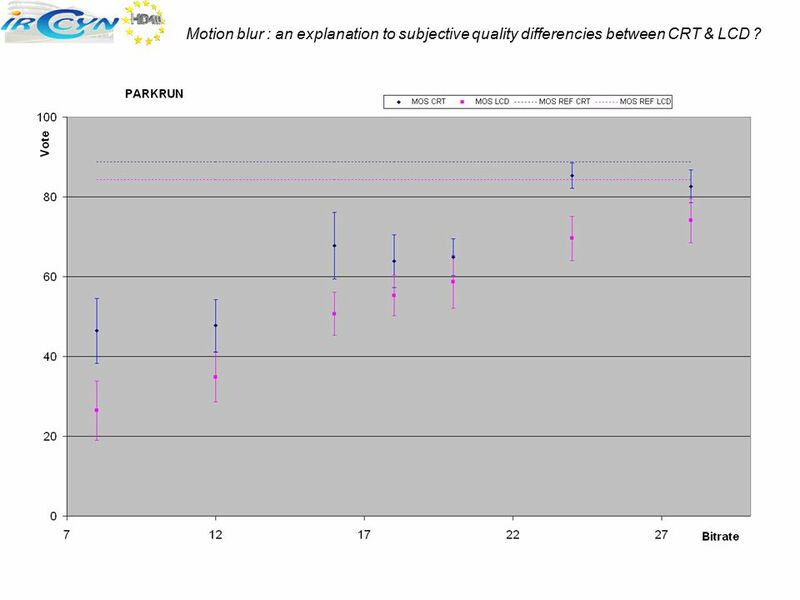 Radiology Understanding Display Characteristics What You Should Know When Viewing Images from PACS. 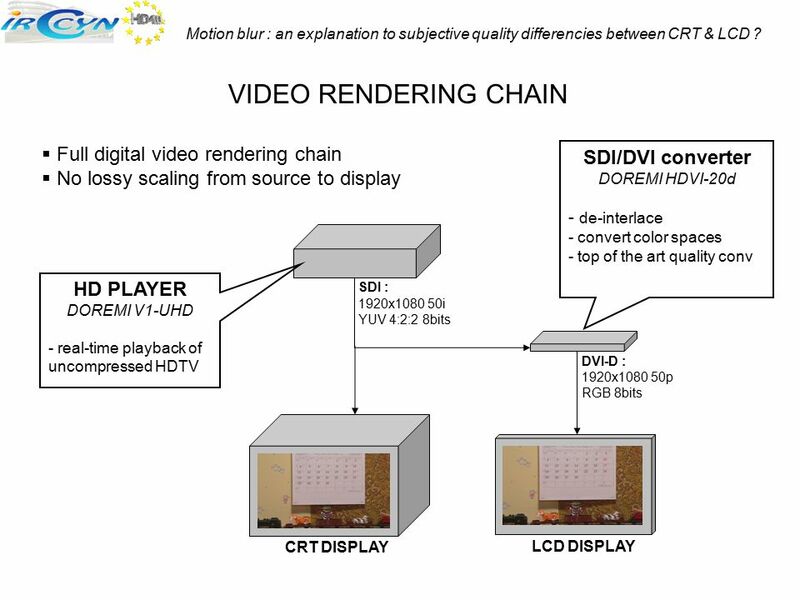 Video enhances, dramatizes, and gives impact to your multimedia application. Your audience will better understand the message of your application. Comp :: Fall 2003 Video As A Datatype Ketan Mayer-Patel. 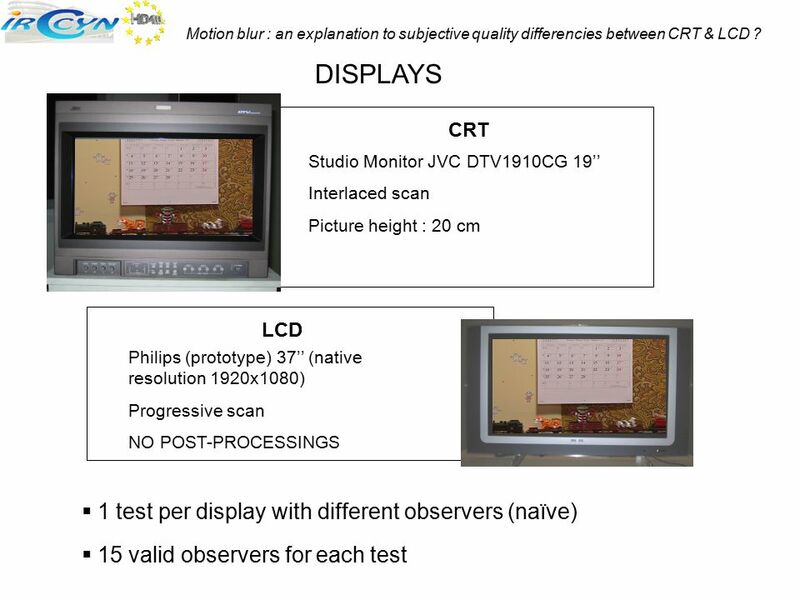 Physical & Psychophysical Evaluation of a Flat-Surface CRT Display Monitor vs Traditional Curved- Surface Display Monitor for Use in PACS & Teleradiology. Sample rate conversion At times, it will be necessary to convert the sampling rate in a source signal to some other sampling rate Consider converting from. Monitors and Sound Systems section 3A This lesson includes the following sections: · Monitors · PC Projectors · Sound Systems. 1 Image Compression. 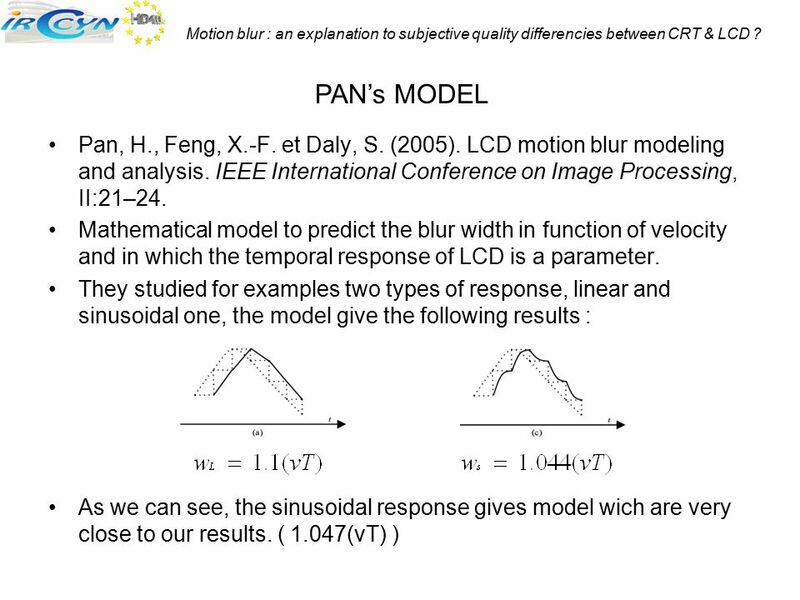 2 GIF: Graphics Interchange Format Basic mode Dynamic mode A LZW method.